Ground beef, cheese, and breadcrumbs make up the filling for these tasty stuffed cabbage rolls. If you prefer rice in the beef mixture, replace the bread crumbs with about 3/4 cup of cooked rice and omit the milk. For a low carb diet, omit the breadcrumbs and milk add some lightly steamed cauliflower "rice" to the meat mixture. The cabbage rolls are topped with strips of bacon and baked to perfection. Cook cabbage leaves in boiling, salted water until tender and flexible, about 5 minutes. Alternatively, microwave the whole head of cabbage for 12 to 15 minutes. When the cabbage is cool enough to handle, peel off the leaves. Combine ground beef, onion, sage, cheese, bread crumbs, milk, and salt. Place a large spoonful of meat mixture on each cabbage leaf; roll up, tucking ends inside to seal meat in. Secure with toothpicks. Place in baking dish and add 1 cup water, broth or tomato juice. Cover the cabbage rolls with the bacon strips and bake at 350 F for 45 to 55 minutes. Instead of tomato juice, combine a 14.5-ounce can of diced tomatoes and an 8-ounce can of tomato sauce and pour over the cabbage rolls before baking. Replace the breadcrumbs and milk with cauliflower "rice" for a low carb dish. Too busy to cook? Take a look at these easy "unstuffed" skillet cabbage rolls or this cabbage and beef dinner for the slow cooker. Special Occasion? 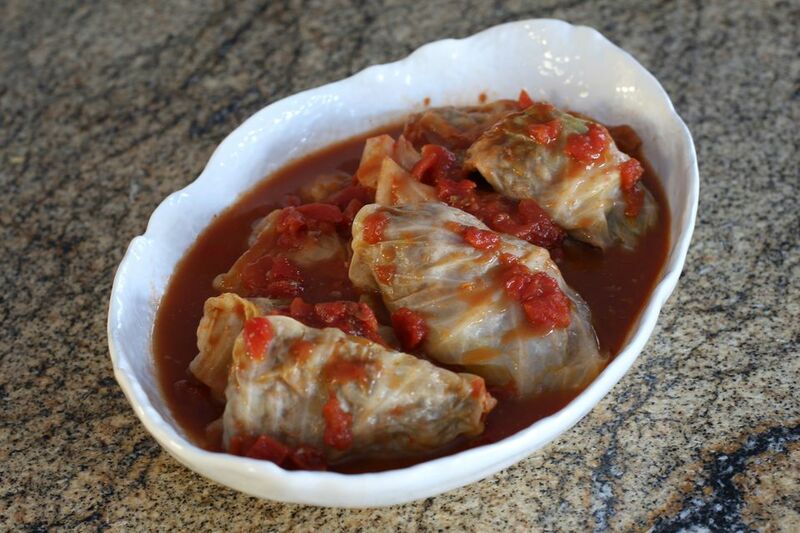 You Can't Go Wrong With Stuffed Cabbage Rolls!